I am so excited to share that I met Lucy Calkins on Friday! I attended her workshop, "Reading, Writing, and the Common Core" which was hosted by the publisher, Heinemann. The workshop was fabulous! She broke down every bit of the reading and writing sections of the Common Core. She provided models of what the thinking should look like and how students should be responding. We watched videos of students engaged in learning aligned with the Common Core. I could not get enough! 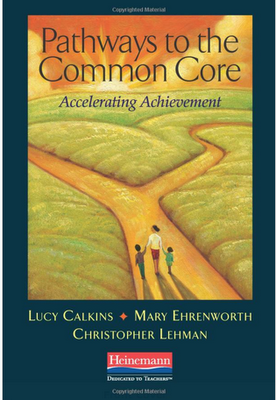 We were able to purchase her newest book, "Pathways to the Common Core" which can be found by clicking the link below. She has sold over 100,000 of these books (and I bet a bunch were sold yesterday). The best part? She signed my book, "Hold on to your dreams! ~Lucy Calkins" AAAHHHHHH!!!! I.was.so.excited! I couldn't wait to show everyone I met (many of whom are not teachers and were like....ooookkkkaaaayy). ;-) If you have the chance to do so, attend one of her workshops. You won't regret it! Let me know if you've had a chance to attend the workshop or read the book. I'd love to hear your thoughts!